Quite a week on the water in Chatham, MA on Cape Cod! To list some of the accomplishments: the first live-captures (on our first attempt no less) of gray seals in the US; coordinated deployments of multiple GPS tags on adult US gray seals; a massive sampling effort to collect data for both field participants present and researchers at other institutions; and media splashes of the important work across regional papers, including the Boston Globe, Cape Cod Times (thats 2 articles and a short documentary), and the local CBS station. But first, let’s recap our purpose here on Cape Cod. The Johnston, Read and Halpin labs (including Dave, Kenady Wilson, and myself) have just returned from Chatham, MA on Cape Cod where they helped assist in the gray seal field research led by the collaborative North Atlantic Seal Research Consortium (NASRC). With researchers from Woods Hole Oceanographic Institute, Riverhead Foundation, IFAW, Provincetown Center for Coastal Studies, and others, this consortium has initiated the first efforts to research gray seal populations along the US Northeast coast. On this particular project were toxicologists, veterinarians, chemical ecologists, fisheries biologists, and spatial ecologists. The field work collected baseline data on toxin load levels in seal populations, age structure in the population, disease prevalence among individuals, and some diet analysis. The Johnston lab is leading the efforts to understand the movement, distribution, habitat use, and density of gray seals in the Gulf of Maine using high-resolution GPS tagging technology. In essence, we are expanding on what we have already done with Bronx, but with more tags on more individuals. A day of work on the water followed a typical pattern that began just before low tide as seals began to haul out on a tidal sandbar within Chatham harbor. We launch from Ryder’s Cove, set our net in the water for the first captures, and quickly capture a few seals that can be studied further. Alongside experienced seal biologists from the Canadian Department of Fisheries and Oceans, we hauled the captured seals onto the beach and began our sampling efforts. Seals that are caught are affixed with a GPS tag that monitors the animal’s movements and behaviors. After this, we collect biological samples from the animal’s skin, fur, blubber, whisker, and blood for laboratory analyses. These crucial data points that are collected build the foundation of our understanding of this top predator’s ecology and its role in the local ecosystem. In just one week, our widely-skilled field crew had honed our protocol–capturing nearly 20 gray seals, deploying 7 high-resolution GPS cell phone tags (in addition to a handful of other satellite telemetry tags), collecting hundreds of biological samples for collaborators, and disentangling two animals with life-threatening entanglements with fishing gear. These accomplishments truly mark the first steps in understanding the growing gray seal populations in the US Northeast. But beyond the data collection, there was a camaraderie that swept over the field crew, many of us working together for the first time. In the evenings, we toasted with scotch to our new collaborations, growing friendships, and important work we had embarked on. 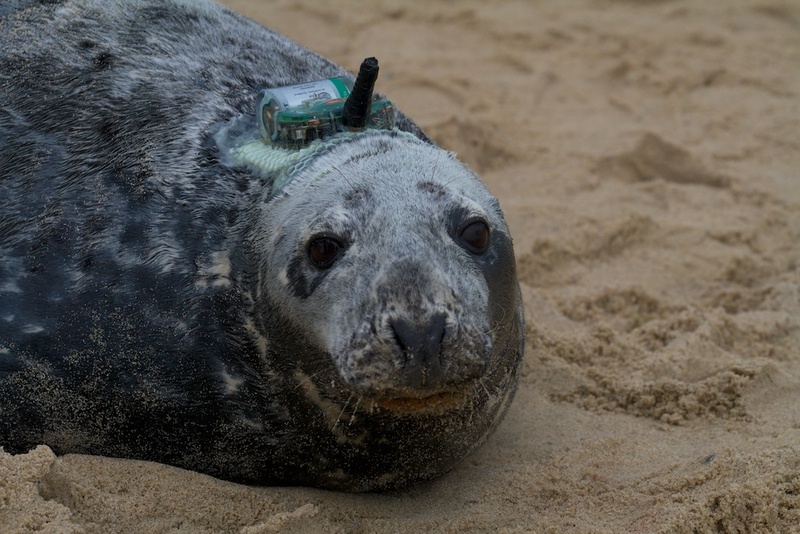 The following mornings, we would awake anxiously to check the new data from the GPS tags as they began to reveal the spatial habits and ecological roles of gray seals in the waters off Cape Cod. 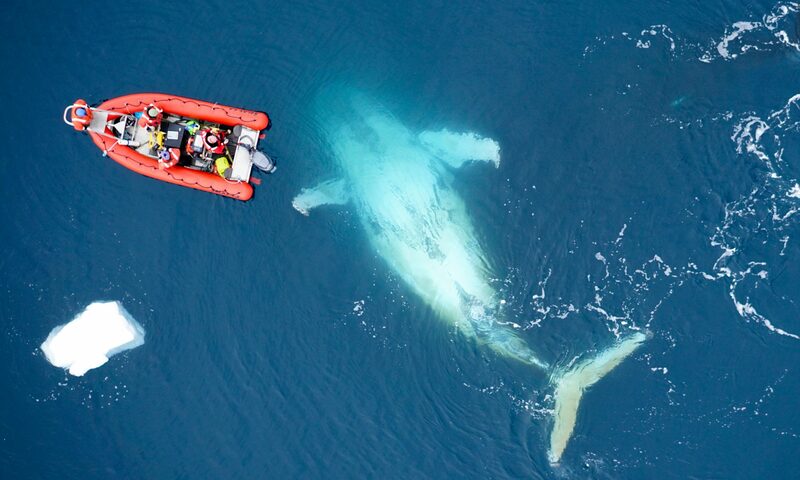 [photo size=’big’ title=’Tracks of 5 seals over first 6 days’]http://superpod.ml.duke.edu/johnston/files/2013/06/hg39.png[/photo] [photo size=’big’ title=’The field crew prepares sampling efforts on a captured individual’ align=’right’]http://superpod.ml.duke.edu/johnston/files/2013/06/2013-06-13-DWJ-IMG_0424.jpg[/photo] [share_buttons] [divider] All research conducted under permit by NOAA, all photos taken under permit by NOAA.